In the last installment of this column, I pointed out that there is no one, true, definitive water concentration for making soap. We are free to make up lye solutions anywhere between about 50% and 25% sodium hydroxide. That's not to say, however, that the water concentration is not important. You get to choose how much water to use, but your choice has important implications for the behavior of the soap. At Hampden-Sydney College, my students and I always mix our lye at exactly 50% sodium hydroxide, 50% water. We make it up in advance so we are never waiting for it to cool, and 50% is very convenient for doing calculations—however much sodium hydroxide is required for a batch of soap, we need exactly twice that weight of our pre-mixed lye solution. While it is perfectly possible to make soap with 50% lye solution, more often than not we have reason to use more water. We treat this water as if it were just another ingredient. If we add no extra water, we call it a low-water soap, and the effective lye concentration is 50%. If we add extra water equal to half the weight of the lye solution, we call it a medium-water soap, and the effective lye concentration is 33%. And if we add extra water equal to the weight of the lye solution, we call it a high-water soap, and the effective lye concentration is 25%. We add the extra water along with all the other ingredients (oils, colorants, scents) and add the lye solution only at the end. Our standard four-oil blend, Duckbar's Delight, consists of 39% olive oil, 28% coconut oil, 28% palm oil, and 5% castor oil, and has a saponification value (including discount) of 144, that is, 144 g of sodium hydroxide per 1000 g of oil. That means we need 288 g of 50% lye solution. For a low water Delight, we add no extra water, for a medium-water Delight, we add 144 g of extra water, and for a high-water Delight, we add 288 g of extra water. Of course, we are free to use any amount of extra water between these values. Adding 72 g of extra water, for example, would produce a medium-low-water soap. While we find this approach convenient, we recognize that most soapmakers make up their lye solution immediately before use. Those soapmakers can simply choose the water portion directly. A low-water Delight uses a 50% solution with a sodium hydroxide/water ratio of 1:1 (144 g NaOH + 144 g water). A medium-water Delight uses a 33% solution with a ratio of 1:2 (144 g NaOH + 288 g water), and a high-water soap uses a 25% solution with a ratio of 1:3 (144 g NaOH + 432 g water). Many lye calculators allow you to specify the “lye/water ratio” and will do the math for you. When raw soap is mixed, it starts out liquid and gradually becomes more and more viscous. When it is viscous enough (a condition called “trace”) it can be poured into the mold, where it hardens up into a solid. As saponification proceeds, the temperature of the solid soap rises, and if the conditions are right, it may undergo a phase change to a soft, translucent state commonly called “gel” in the handcrafted community and “neat soap” in the commodity soap industry. It is as if the solid soap melted, becoming a viscous translucent liquid similar in appearance to Vaseline. The temperature at which this transformation takes place depends on the water content. A low-water soap melts at a high temperature, and a high-water soap at a low temperature. 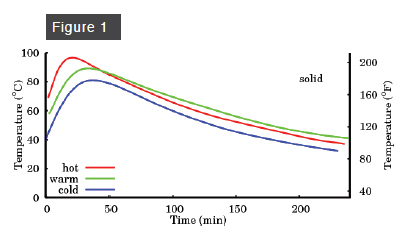 Figure 1 shows what happens to the temperature of a low-water soap during the first four hours after mixing. If the initial oil temperature is relatively low (100º F, “cold”), the temperature rises to about 175º F in about 45 minutes. At an initial oil temperature of 140º F (“warm”), the temperature rises to about 190º F in about 40 minutes. At an initial oil temperature of 160º F (“hot”), the peak temperature approaches the boiling point of water in about 20 minutes. The melting point of low-water soap, however, is higher still, and so none of these low-water soaps (cold, warm, or hot) will reach gel phase. 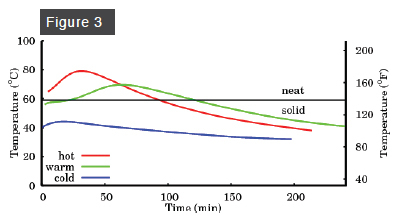 The story for medium-water soap (Figure 2) is similar, except that it melts at about 160º F. A cold or warm medium-water soap does not reach this temperature, but a hot medium-water soap does. 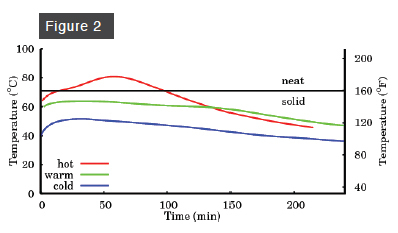 The melting point of a high-water soap (Figure 3) is about 140º F, and so gel phase is attained by both warm and hot high-water soaps. The appearance of gel phase, then, depends on both the water content and the initial temperature. 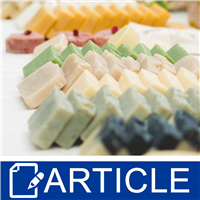 If you want to force your soap into gel phase, you want a medium- or high-water soap, and a high ultimate temperature, achieved either with a high initial temperature or by oven processing at a temperature sufficient to melt the soap. I am often asked whether it is necessary or desirable to reach gel phase. The short answer is that it is not necessary, and it may or may not be desirable. We have made many fine soaps that did not gel. Most consumers would be hard pressed to tell the difference between them. The subtle difference between them becomes noticeable when only part of a soap gels. This “problem” usually happens because the interior of a block of soap is hotter than the exterior. The soap in the hot interior melts, while that on the cool exterior does not. I put “problem” in quotes because it can become a “feature” if you can do it on purpose for an artistic effect. That fascinating prospect will be the subject of a future installment of this column.